Leghorn offers a wide range of Tyvek wristbands in a variety of colours, patterns and barcode option, so the model you choose compliments your event. 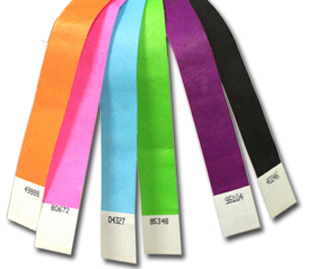 The great advantage of the Leghorn Tyvek wristbands is their tamper-proof nature which lowers the chances of guests switching wristbands with others. They fit around the wrist and are permanently locked in place so they cannot be slipped on or off the wrist. Tyvek is also waterproof, ensuring that our bands can be worn in any weather. •Our Tyvek bands are the perfect method of identifying your paying customers. Tyvek Wristbands can be used in almost all applications where a visual means of identification is needed. Made of strong, waterproof, lightweight Tyvek®, the wristbands comfortably adjust to any size and are easily applied to the wrist with an adhesive strip. • Tyvek® wristbands are our most popular and economical wristbands. • They are best used for short term/single use applications. • Choose from our large stock of Standard or Premium wristbands or create your own custom wristbands online. • Consecutively numbered in each box for extra security and control at no extra charge! Stock Wristbands are sold in quantities of 500 Custom Wristbands are sold in boxes of 1,000. 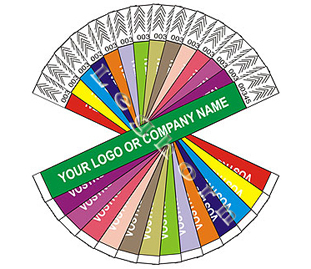 • Multiple stock colours available for most wristband designs. Durable, and tear resistant with a strong adhesive closure and unique security tamper slits that cause the wristband to shred if tampered with. Take advantage of our volume discount pricing on both our Standard and Premium wristbands. Stock wristbands dispatched within 1-3 business days after payment.